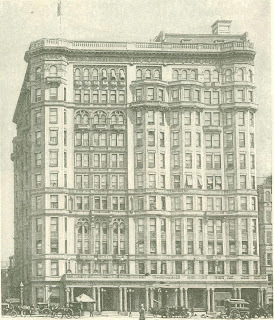 A visitor from New Zealand, to paraphrase Lord Macaulay's celebrated phrase, who should take his stand upon the arch of the Brooklyn Bridge, and view the brick and mortar wilderness of New York, could hardly fail to discover most of the hostelries I am going to mention by their mere size and towering stories. "You Americans," one can fancy the sarcastic foreigner remarking, with a supercilious twirl of his mustache, "are forever preaching your ridiculous doc­trine of equality; and yet I am hardly landed in your city before I see the palaces of your plutocrats looming gor­geously ahead of me." "Ah, yes, my dear sir, those are palaces, indeed, I grant you," says his smirking cicerone, "but they are palaces for the people - for the people who can pay, that is - and are as free to you and me, who have the price, as - what shall I say? 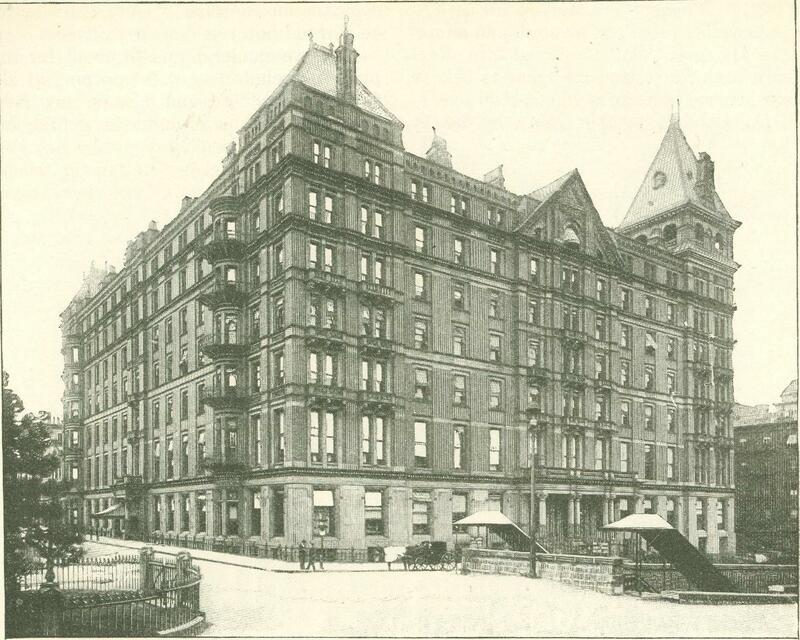 As a most pleasing and invigorating native stim­ulant known as a Manhattan, to which I hope to have the pleasure of introdu­cing you the moment we get off this wearisome long bridge and arrive at the Astor House in Broadway." 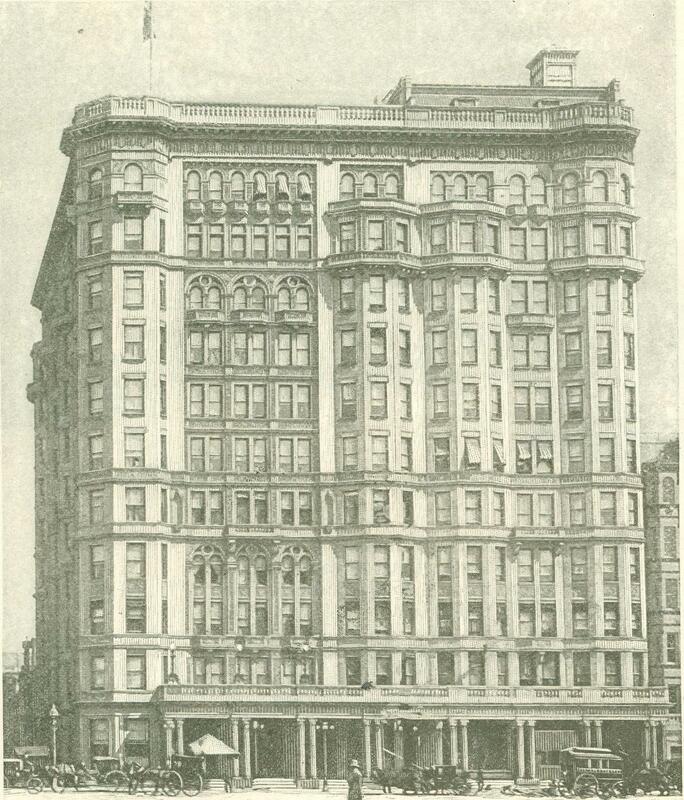 Broadway used to be the street for hotels, and when our fathers climbed up Trinity Church steeple, to get a view of the town, they could look over the roofs of most of them, and, on a clear day, see the circus tent on the green hill top where the Fifth Avenue now stands. 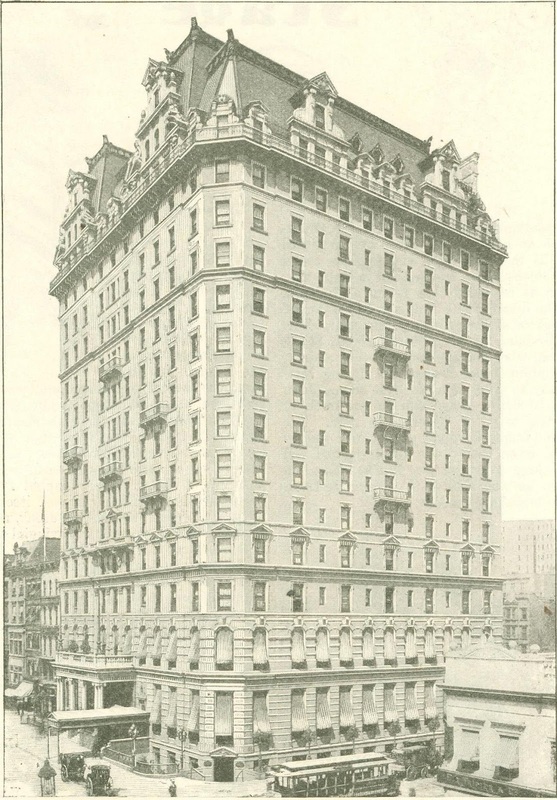 Fifty years ago that was, and now all the big new hotels, with bedrooms ever so much higher than the steeple window, have deserted Broadway, and planted their vast buildings in Fifth Avenue, and in our dear American Belgravia, the "upper west side." 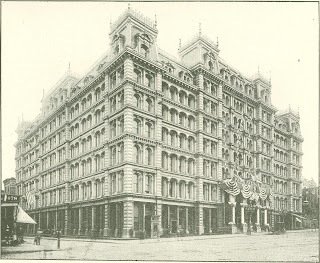 There is a way, I believe, practiced by certain visitors and young gentlemen about town, of doing the New York hotels, which is easily and joyously ac­complished by hiring a hansom cab and stopping at each of them in turn. But as we, I trust, are sedate and orderly persons, and moreover, as we expect, I hope, to see something of the ladies, we will avoid all masculine shrines, below Twenty Third Street, at least, and go at once to the staid old Fifth Avenue, because it is still good, and historic almost, and has entertained more distinguished people than any hotel standing. Look at that plain white marble facade facing Madison Square, and the long straight corridor within. 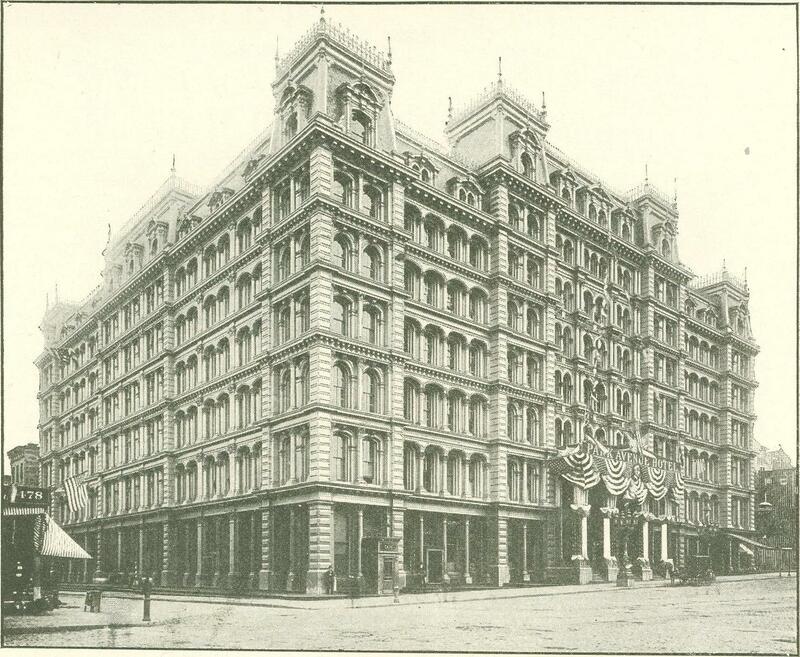 It has been the headquarters of the Republican Party for years, and hundreds of statesmen and warriors, General Sherman and Mr. Platt among the rest, have made history there, and smoked and chatted and toddled off to bed up the stairs, opposite the desk. The Hoffman House, built a good many years afterwards on the block above, tops it, and has always been favored by politicians of the Democratic persuasion, because, I suppose, they could be near their friends and antagonists. This hotel, a dozen years ago, was noted for the expensive­ness of its decorations and appointments, and contained a huge bar filled with the costliest objects of art. Bouguereau's noble painting of the "Satyr and the Nymphs" hung there, and ladies used to be permitted to walk through and admire it. The great bar is turned into a bil­liard parlor now, and the house, I believe, has become more of a commercial one. Do you like a table d'Inite, by the by, or just to order what you choose? They don't serve a table d'hote at the Waldorf-Astoria, but if there is any other mortal thing a guest can ask for and not get it, may I be charged double for the next meal I pay for there; and that will be penalty enough. The Waldorf is not in­tended to be an inexpensive establish­ment, and makes no pretense of being operated on the plan of Mr. Mills' justly celebrated hotel.in Bleecker Street. Still, we can go in and sit about for the price of a cigarette or for nothing at all, for that matter; and I hope my New Zealander will be brought here first, because in its way the place is sui generis, in spite of the fact that most of the newer hotels are modeled after it. Nevertheless, this air of hilarity, I hasten to remark, is tempered by the rarefied atmosphere of functions, and you are instinctively made aware that however hos­pitable the restaurant is, the parlors above may be the reverse of accessible. Gentlemen apparently respond to this appeal by donning evening clothes, and most of the ladies appear as if they were going to a party. The young women arrayed along the Thirty Fourth Street corridor wear a more or less conscious attitude of expecting you to ask them to dance, and their attendant parents view the frivolous scene with that lenient worldliness with which they deposit a five franc piece on the roulette tables at Monte Carlo. At home it would be shock­ing, but in frivolous New York they are here for a good time and mean to have it. This impression; I say, of subdued revelry, of champagne diluted with seltzer water, comes back to me, when I try to evoke a taste of New York hotel life, as the most permeating flavor left upon a palate too often irritated, perhaps, to be responsive. 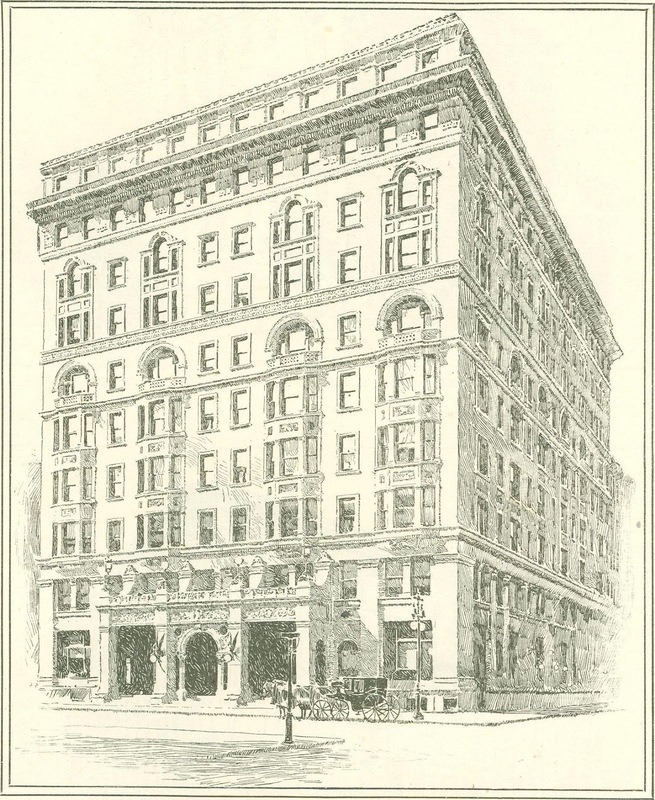 But I am reminded that, however temptingly pictorial the subject may be, it is not within my province to sketch the effect of hotels on the human background, but rather to-give as illumi­nating a notion as possible of the striking features of these great New York hostelries. 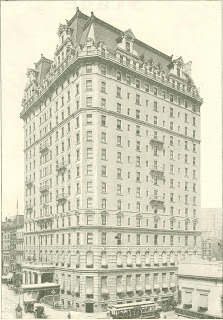 Farther down Fifth Avenue, on the corner of Thirtieth Street, is the Holland House; above, surrounding the open space where this fashionable thoroughfare widens and dips into Central Park, are the Plaza, the Netherland, and the- Savoy Hotels; on the corner of Madison Avenue and Forty Second Street is the Man­hattan; and at Park Avenue and Fortieth Street the Murray Hill. These are all very big little brothers to the Waldorf, and done "regardless of expense," as the advertisements say, though they lack the peculiar social, show dining feature which makes the Waldorf so fascinating and beautiful. They are simply very fine and huge and lofty and decidedly expen­sive places in which to eat and sleep and lounge. 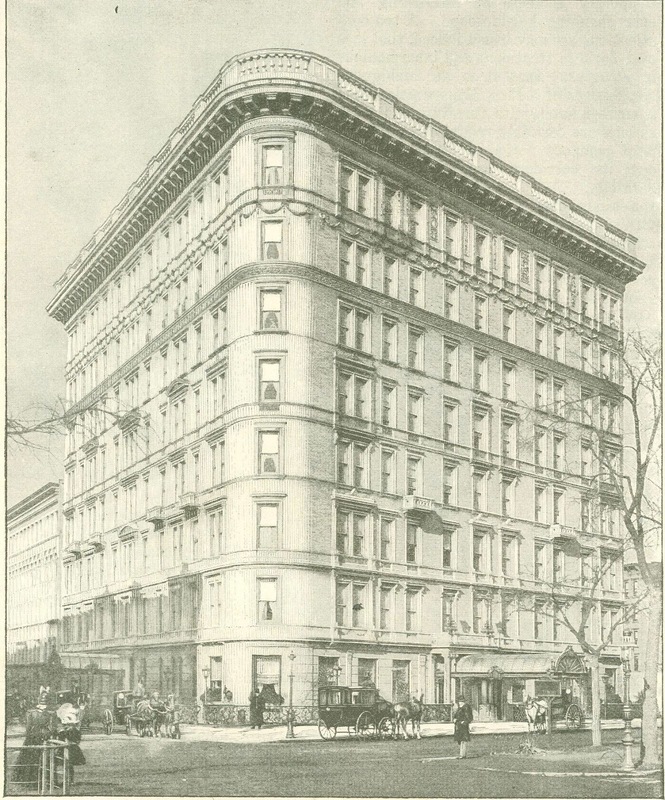 Upper Fifth Avenue has not as yet been invaded by the builders of great hotels, but on the west side of Central Park there are several new and immense hostleries which in every way rival, I am told, their down town neighbors. 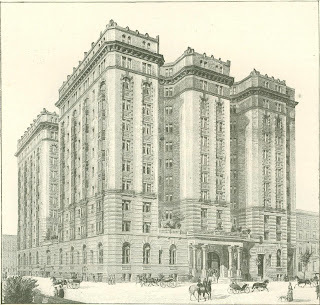 The Majestic, at Seventy Second Street and the Park, is certainly big enough to quar­ter a regiment, and on the Boulevard are the St. Andrews, the Marie Antoinette, and several others. The Majestic was the first hotel to inaugurate a roof garden, which has been so delightful a feature of the Waldorf for the past two years, and where they have music and light refreshments and a wondrous, strange view of the city's myr­iad lights twinkling be­low in the darkness. The most recent de­parture in hotels is the big combination hotel and apartment house. There are a number of these scattered about the town, and they are arranged for both bach­elors and families. You have your, suite of rooms by the year, fur­nish it yourself, and either take your meals, at so much a week, in the hotel dining room, which is exclusively for the guests, or live out, as you choose. For a small family, it is much less expensive than hiring the same number of rooms at an ordinary hotel, and you enjoy the felicity of having your own Lares and Penates about you. Light, heat, and attendance are included in the rent of the apartment. Speaking of the apartment hotels leads me to refer to a peculiar characteristic of American hotel life - its substitution for home life. This is the one social lesson London has learned of New York, and for the past few seasons it has become quite a fad for families there to spend a few weeks between seasons at the Cecil or the Savoy. With us the custom, after a period of decadence, is undoubt­edly again on the increase, and when one reflects on the cares of big country houses, and the st4ain of entertaining, one doesn't wonder people pre­fer wintering in establishments where the only worry in existence consists in ordering one's meals. Think of it! You arrive tired, dusty irri­table. Your bag is whisked out of your hand, and you are conducted through a brilliant hall, with a dazzling glimpse of the dining room, sparkling with glass and china, suggestive of all the good things imaginable, to the lift. You enter. The boy with your bag enters, too. Presto! You find yourself in a bijou of a suite, with your trunks await­ing you, with a bed which simply beseeches you to repose on it, and with a porcelain tiled bathroom all your own. You press one button in the wall; electric lights flash up. You press another; a maid or valet, as the case is, knocks to unpack your luggage and help you to dress. You press a third; a hall boy appears, like the slave of Aladdin's lamp, to execute any possible command monsieur may issue, from fetching a glass of iced water to or­dering a banquet served up to you. 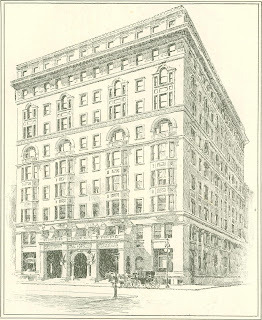 In the little hall outside your parlor is a tele­phone connecting you with the office, and I suppose one day's list of the requests transmitted over these instru­ments, in any of our large hotels, would make a marvelous catalogue of the mul­tiplied wants this luxurious life has generated. Do you wonder, I say that people like to live in such places or that the women refuse to accept the vexations of house­keeping? It may be a pampered, false, artificial way of life; but this is not a moral treatise, but a statement of facts, and I humbly admit that if I were very rich, and didn't know how to manage a great establishment, or were tired of maintaining one, I should go straight to such a hotel, where I could live just as I chose, where I could stay as long as I liked or be off at a moment's notice, and where the key in my pocket was the open sesame to every material pleasure. Nevertheless, it was a noble deed in him who erected it. 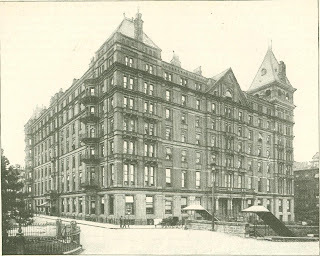 It saves many a homeless, broken man from the horrors of the Bowery lodging pens, and, singularly enough, it is one of the best paying hotels in town. 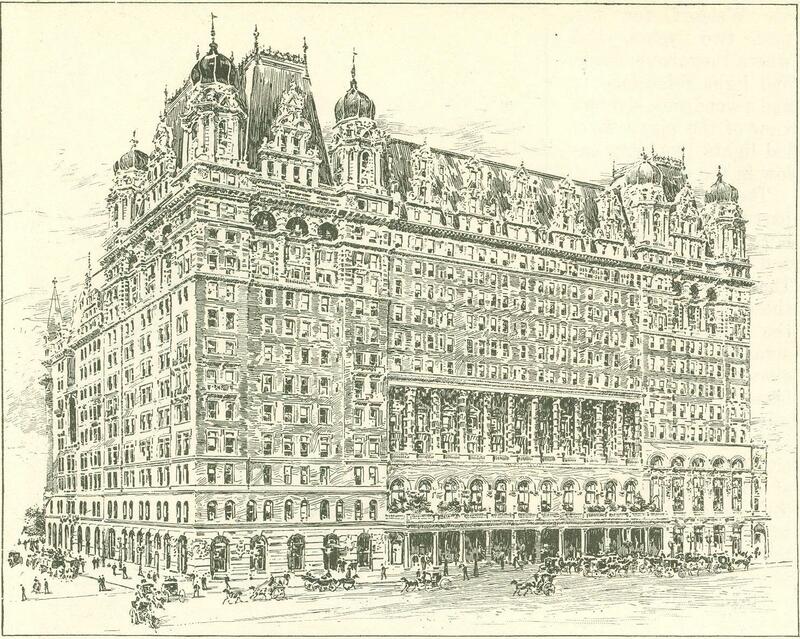 Personally, I shouldn't care to stop there, and a diet of corned beef and cab­bage would give me dypsepsia confound­edly, but really I don't know of a better way to give a stranger an adequate idea of New York life than to take him first to the Waldorf and afterwards to the Mills. As I write, the clock is chiming mid­night, and out of my window, in one of the apartments I have referred to, I can see across the dark, shining city street, blazing with lights and showy with flags in welcome of the great admiral whose tri­umphant warship is even now in home harbor, the enormous hive of fashion of which we were recently talking. Hark how the cabs and carriages rattle up to it, how they are laughing and feasting luxuriously within. Society is gathering about it to see the parade, which will have marched into history ere these words are printed, and the rest of the world followed it there, too. And on the other side, away down below me, underneath all that light and bright gaiety, where Ital­ians live, and hucksters shout, and trains rush past, and vice hovers, and hunger begs, and laborers reel to squalid garrets, and the night seems low and dark, hun­dreds of poor weary fellows are turning has into those other bare, clean, lonely cells, and thanking God, perhaps, for the luxury of them. Vae vietis! Let us say our prayers tonight, friends, humbly thankfully, penitently. Those old building hotels are so beautiful. Imagine if we can see them with colors. One important aspect that makes people come back is the accommodation and warm hospitable itself.